Enterprise Equity Venture Capital (“EEVC”), Ireland’s longest established VC, has teamed up with 500 Startups, a Silicon Valley venture capital seed fund and startup accelerator, to help Irish technology companies gain better access to the Silicon Valley ecosystem. 500 Startups (http://500.co) invests in internet startups on search, social, and mobile platforms through a 12 week accelerator program which focuses on design and user experience, distribution and customer acquisition, and lean startup practices and metrics. In just three years, 500 Startups accelerator has cemented its position as one of the top programs for founders who are looking to improve their products and reach new users. The program, which runs four times a year, now graduates more than 100 new companies annually, with each receiving an investment of $100,000 on completion. Operating for over 25 years, Enterprise Equity Venture Capital has invested in excess of €50m in over 80 companies. EEVC invests in well managed, genuinely innovative and growth orientated businesses across a wide range of sectors, including the software sector and high technology manufacturing, particularly the medical device industry. The company manages three funds totaling some €84m / $105m, including the AIB Seed Capital Fund, the largest and most active seed investor in the country. The strategic alliance between EEVC and 500 Startups will offer Irish start ups the opportunity to fast track through the process to take part in one of the accelerator programs run by 500 Startups each year. With just 30 places available on each program, competition for inclusion is extremely high. Approximately 1,000 applications are received for each program, with just 100 proceeding to interview stage. 500 Startups has agreed to fast-track selected Irish applicants recommended by Enterprise Equity, to interview stage – offering a significant head start to Irish startup companies. During each 12-week program, the 30 selected startups work together within the same office space, with access to staff and mentors to help them grow their business. The 500 Startups accelerator is particularly strong in helping startups to understand their internal metrics and distribution, offer advice on product improvements, working with them to identify their target audience and advise on how to market their products and services more efficiently on a global basis. 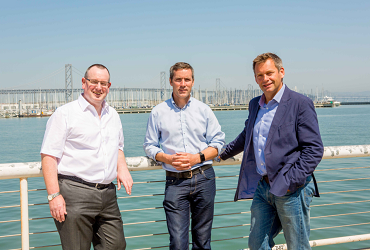 EEVC has invested significant time over the years in developing its US networks, particularly in Silicon Valley, and to further extend this reach, the company has recently appointed Philip McNamara as its US Venture Partner, based in San Francisco. Philip is a serial entrepreneur and connector in Silicon Valley. A co-founder of four companies in Ireland, the UK and Silicon Valley, Philip is extremely active in the start-up space in Silicon Valley and regularly helps start-ups to grow, raise finance and scale their companies. Philip is Managing Director of Voxpro USA, and advises several other companies based in the Valley. Previously, Philip was the co-founder of Inspire Nation, TapMap and GrokLabs. EEVC is an active Irish venture fund manager based in Dublin, Cork, Galway, Dundalk and San Francisco. It is focussed on investing in early stage businesses based in Ireland, typically up to €1.5m per company, which have significant international growth potential. EEVC invests in the technology, technology services, multimedia, wireless, financial services and food sectors where there is a likelihood of a realisation of investment within approximately five years. It has invested over €50m in 87 companies to date. EEVC participates in larger deals through its well developed network of international syndicate partners.